Come on man. Are you really looking for a review of this card here? Why are you even looking at this card? There is no conceivable reason to put this in a deck. Eureka? Sure, but motivation is better, and you're losing as much as you sunk into it out of the already marginal value of Eureka. Windfall? No, don't be fooled, you shuffle before resolving Windfall, unless there is a paid ability window between the shuffle and the resolution. Which, there isn't. If I won't play this card, no one should. The goal of this card is not to set up a combo in and of itself, so much as to be the tutor. Don't think of it as the Eureka combo creator. Instead imagine you need to get a copy of Personal Workshop and a Order of Sol out to be able to start running as Nasir. And as Nasir with these cards set up you are ready to rock. 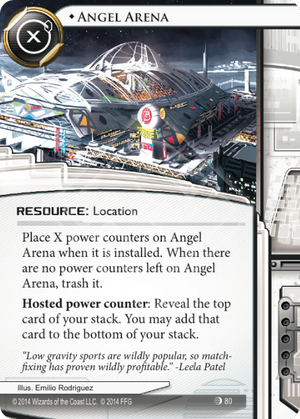 Angel Arena helps you by letting you past the stuff you don't need NOW while you search out the stuff you do need now. But this card has been out for more than a whole cycle and isn't setting the world on fire. So here's the issue... It is crazy expensive for something that isn't the only way to get things done. Criminal? Mr. Li gives a very similar effect. Anarch? Try Paige Piper instead to simply thin your deck. Shaper simply says I'll use Diesel and Quality Time and then Levy AR Lab Access later to get my options back into play. While this card -- requires a huge upfront expenditure even for a tutor, and isn't a sure thing to even get your card. So what would need to change in the meta for this to become a little more useful of a card? Well, if it did have internal combos that were easier to pull off that would help, but even then Motivation works better for most options that would work for Angel Arena. Practically, until the need for at-will reveals of the top of your stack have a place, this card will always be one that stays in the binder crying "let me in coach." Even then, something may need to exist that makes good use of X cost cards for this to fire. It gives you an exchange of credits for power to dig through your deck for what you need. You click to install for X. Use those X counters to dig through your deck and maybe find what you needed. Draw it with the second click and perhaps you still have some counters left on the arena (which allows it to potentially be used multiple times with a single install) and a few clicks to play the card you drew. Obviously the more counters you stack on it the better it is for finding anything. It is a tutor which can find anything, but becomes very expensive if you want it to be more effective.